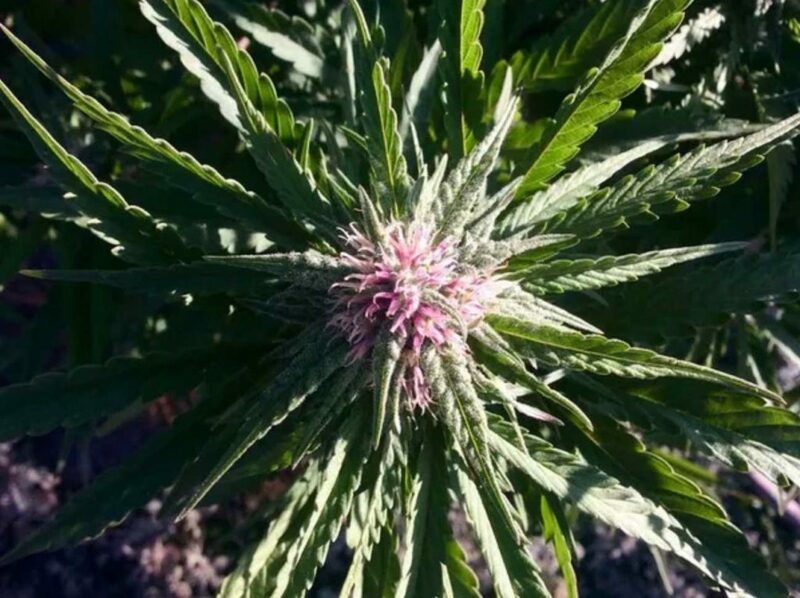 This article marks our continued chronicles of the Emerald Triangle through the lens veteran residents and growers Nikki Lastreto and Swami Chaitanya. For more on the history of the marijuana mecca, revisit their last article here. As the shadows grow long and the breeze has that cool refreshing hint of autumn, all the farmers around the Emerald Triangle in Northern California begin to think one thing: “harvest.” It’s time to get out the tubs, trim trays, scissors, black-out cloth, or your other favorite accoutrements for the season. It’s kind of like getting out the ornaments to trim the tree really, just for the festival of Cannabis instead of Christmas. The other clue that harvest is coming is at the grocery store. About ten years ago, the tiny Mendocino County town of Laytonville — with a population of roughly 1,300 people, though it easily doubles at harvest time with the influx of “trimmigrants” — won an award from the giant Reynolds corporation for selling more of their “Oven Bags” than anywhere in the country. Also known as “turkey bags,” these clear plastic bags are the best at sealing in the strong odors of cannabis. Hence, they have been used for years by all the farmers and middlemen in the biz. As harvest approaches, there are more shelves in shops selling turkey bags, scissors, and gloves than there are back-to-school items. Building supply stores are stocked with tubs of every size, dehumidifiers and fans, as well as the ubiquitous scissors and latex-like gloves for trimming. You’ll find those items at pretty much every store in Mendocino, from the gas station to the liquor store. Chances are they’re right next to the lighters. For decades, small pot farmers tucked away in the Emerald Triangle had a fairly routine schedule. Every farm pretty much had a solid crew of close family and friends to help cut the crop, bring it in, dry it, and trim the flowers. When it was a good year, they may have brought in auxiliary trimmers from around the world. In popular trimmer destinations such as Garberville, Willits, or Laytonville, farmers would jump in their trusty pick-up trucks, drive to town and meet up with some young folks from just about anywhere you can imagine. Tibet, Japan, Europe, Central America, South Africa, Israel — we’ve met them all. They’d hop in the truck and be driven out some dusty dirt road, in the old days as often or not blindfolded. Cannabis is a magnet, but it also has its secrets and its quotient of paranoia. Every day the colas or branches on the cannabis plants get bigger and heavier. The little hairs on the flowers are still greenish/white, but will soon turn a burnt sienna, signaling their ripeness and their vulnerability. Back in the old days, harvest was a time of palpable fear. A whole year’s work and investment could be lost to mold or mildew, or to marijuana rustlers cutting tops or whole plants in the middle of the night, or by the Task Force dropping in on cables dangling from helicopters before using your own chainsaw to ruin your crops. 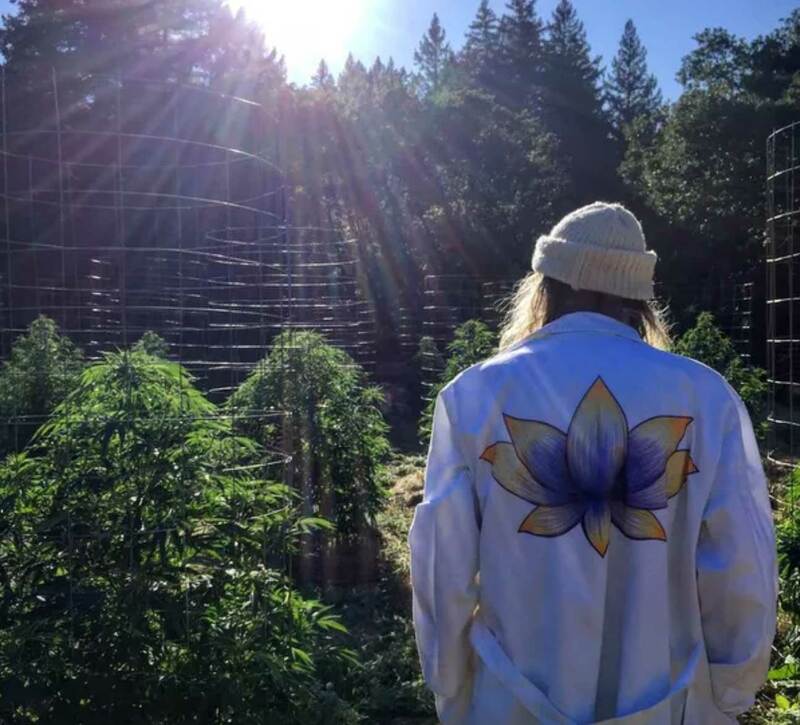 Now, late September and early October, is the time for the conscientious farmer of the Emerald Triangle to keep a close eye on the girls in the garden as their flowers ripen. Insects and pathogens are always a threat. Growers need an eagle eye or maybe “Mold-dar” to detect the first hint of mold or mildew on a plant. Wilted brown leaves should be removed so the they don’t hold moisture. Branches need to be propped up, as they grow heavy with luscious buds. The farmer’s work never stops. It’s a tense time. It ain’t over ’til the buds are bucked and in the bag. 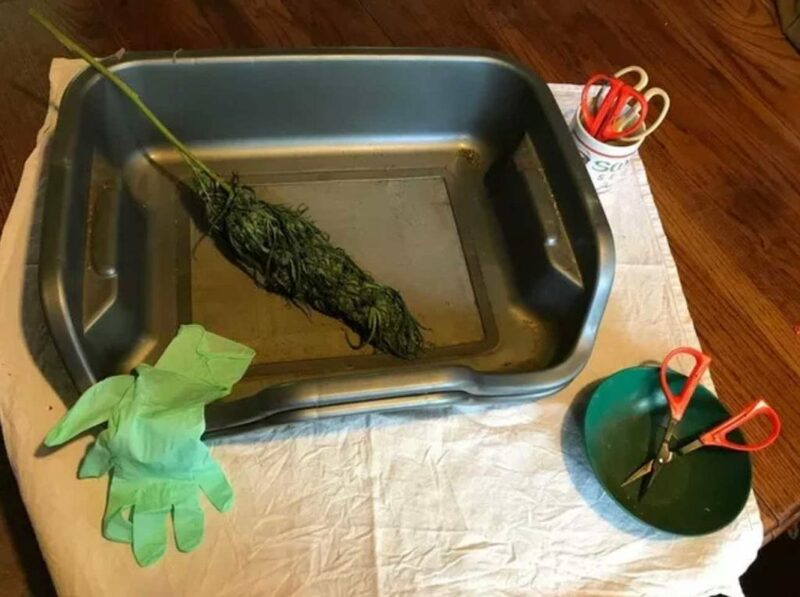 Meanwhile, at home on the farm, everyone is hustling to prepare their spaces for drying and curing. The first thing many of us do is to check the Farmer’s Almanac, which has been pretty right-on lately. This year some rainy periods are predicted, including possible heavy showers, so dehumidifiers are essential. Last year, the surprise rain that broke the previous four years of drought left many people literally high and not dry, so “de-hues” have been a popular item in stores this year and last. The next big question comes as the trichomes sparkle and change from clear to amber. Every farmer must make the decision of when to cut. Are the girls ready? When are they perfectly ripe? There is only a three-to-four day window. Everyone has their own way of deciding, from using magnifying scopes to psychic kinesiology. Again, every farm has their own style of harvesting, drying, and processing its cannabis. Some change their style every year, as new ideas spread across the county through word of mouth suggestions. There always seems to be a new way to do it, to add it one’s tried-and true-technique just to see what happens. Some farmers are loyal to their ways, and rarely veer from their classic process. Still, others recognize that it all depends on the flowers themselves: the plants will tell you how they want to be treated. On top of the stress of properly harvesting your cannabis, the weight of all the rules and regulations is beginning to become real with legalization looming. Commercially permitted buildings will be required for all processing, drying, and processing, including handicap bathrooms. Hairnets and sterilized rooms and equipment are a necessity already. It is very clear that the new rules for cannabis cultivation and processing exceed any other sort of agricultural crop in California. Considering we were all basically outlaws just a few years ago, this new regimen is overwhelming. Hence, this harvest season is unique for the farmers of the Emerald Triangle. While the normal gloves and scissors and trim trays are being gathered, so are the permits and licenses, lawyers and accountants to cover our butts and our buds. Farmers who are in the process of applying now for their permits must be aware of all the new hoops and how to jump through them. Just knowing how to grow great cannabis is not enough any longer. For more on Nikki and Swami’s intrepid storytelling and grand insight into all things cannabis, visit their website here.